Dion Cini holds a Trump 2020 banner at Walt Disney World. Image blurred by source. Walt Disney World has banned a man who held a "Trump 2020" sign on Splash Mountain just weeks after he hung a similar banner at the Magic Kingdom. Dion Cini of New York City was photographed holding a "Trump 2020" sign while wearing a "Make America Great Again" cap on Splash Mountain last week. The photo was among those taken of all of the water ride's passengers, which they can purchase afterward. Disney said that as a result of the display it has "permanently prevented" Cini from visiting its parks. The contents of Cini's sign were not an issue, the company said, but rather that it violated park policies prohibiting the unauthorized use of any flag, banner or sign for commercial purposes or to incite a crowd. “Walt Disney World welcomes all Guests to enjoy our parks; however, demonstrations and the display of signs and banners is not permitted on the premises. We have previously reminded this guest about our rules,” a Disney spokesperson said in a statement. 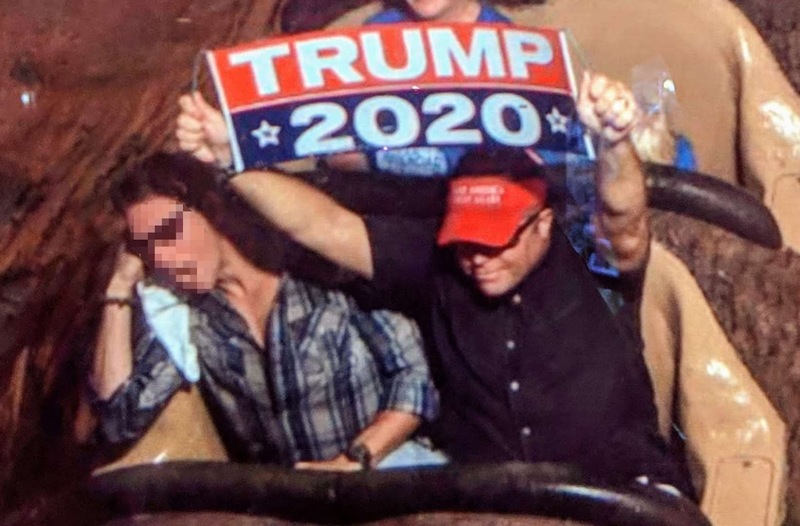 Cini, an annual pass holder at the amusement park, had previously held another Trump sign in Walt Disney World's Magic Kingdom. His annual pass was at the time "paused" so employees could have a discussion with him about the park's policies, according to Disney. Cini was allowed to come back after that incident, but Disney said that after the second offense he was banned. Cini did not immediately respond to a request for comment by NBC News. "Banned for life from Walt Disney World for the 2nd time in a month. They hate my signs, or the President? Maybe both?" he wrote on what appears to be his Facebook page. Cini told The Washington Post he had intended to go viral by bringing the sign on the ride. He also tried to produce viral images in the past by unfurling large Trump signs at Yankee Stadium and the Broadway show "Frozen," according to Newsweek.